Do you make decisions partially based on feelings? Well, what about when you are purchasing clothes, linens, or other textiles for around your home? Did you know that the way something feels can often be quite indicative of the overall quality and durability of the item? We take extra care when laundering and cleaning your items, but we’ve also included a list of fabrics and materials to avoid when shopping for your cloth items. Acrylic: This is often used in less expensive knit items. While acrylic sweaters will look nice for a few wears, if you have to wash this item, you’ll start to notice pilling and even other deconstruction. 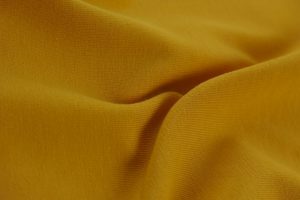 Polyester: While this might be great for athletic wear, avoid this material in everyday clothing. Polyester doesn’t allow your skin to breathe properly, and also doesn’t have the same quality as other materials such as wool or 100% cotton. Bonus Tip: If you’re shopping for dish rags, avoid a polyester blend at all costs as it tends to not be as absorbent as cotton options. Rayon: This is another synthetic material that can be difficult to care for. Additionally, it is typically used in less expensive brands and can be considered of lower quality. Rayon can be great for the right occasion or outfit, but generally doesn’t maintain its quality well. Extra Stretch Denim: Going with the minimalist trend, you might gravitate to owning fewer items of higher quality. While having some stretch to your jeans could be essential to comfort, super stretchy jeans will often lose their shape or become too tight within a couple of washes. Pleather or Faux Fur: Again, these are often packed with synthetic materials, and unless they are of high quality, tend to look cheap or even tacky. In short, when it comes to materials, look for the real thing. Avoiding synthetic materials will be cheaper in the long run as they’re better for you and will last longer. What are some of your go-to fabrics?